In an effort to survive the chill winds which blew through British industry in the Sixties, the Associated Motor Cycles group proposed a merger with Norton in 1962. 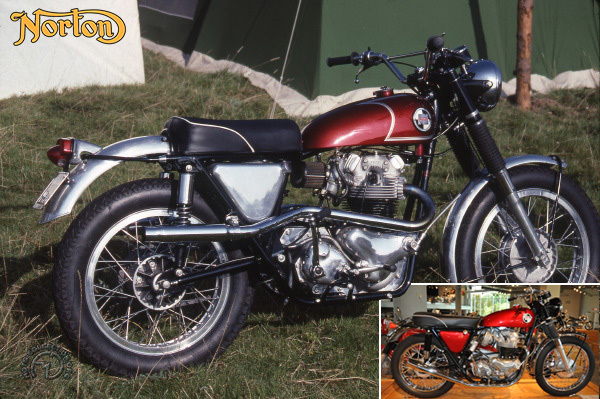 The association took full effect in 1966 and production was henceforth limited to big 650- 750cc machines: the Featherbed-frame Norton Atlas 750 and 6SOSS, the Norton N15 (with a Matchless frame) and the big Matchless G 15. Even in such a moribund market, the time was ripe for something different. In 1966 Norton designed this 750 P11 with the big twin-cylinder engine of the Atlas sports road bike in a lightweight frame. It was a flop, and was on the market less than two years, despite an attempt to relaunch it under the name "Ranger"; it was finally rendered obsolete in 1968 by the launch of the Commando Fastback. Much nicer to ride, the Fastback had the same powertrain, but different engine mounting made it smoother to ride . With hindsight, the P11 seems a brilliant concept, for it invented, twenty years before its time, the fashionable modern concept of a big off-road motorcycle. Light and lively, it was an ideal machine for getting away from it all off the highways or on mountain trails, but was still good in town. Never mind those harsh vibrations; its engine excelled in such conditions and its one great failing was that it never caught on in the vital American market. With its torquey engine, the featherweight P 11 was an amazing two-wheeled plaything.